The Charcoal Vow: Raise your right hand and repeat the following: I vow to never use lighter fluid, when lighting my charcoal, ever again! You may be thinking; why would I never want to use lighter fluid ever again? One of my favorite Weber accessories is the Chimney Starter (to learn more about it click here). A couple things separate Weber Chimney Starters from others in the market place. First they are designed to hold more then enough charcoal for your grilling needs. Second they have a cylindrical cone on the inside, which allows charcoal to rest up and down on the inside, allowing your charcoal to light quicker. Thirdly, the vents are strategically placed throughout the chimney to ensure a good flow of oxygen to the charcoal. Last but not least they have a heat shield, which allows you to hold the chimney and a handle to help when dumping your charcoal on to the charcoal grate. Rule of thumb, always make sure to wear a pair of Weber grilling mitts when handling the chimney starter. Now that you have your Weber Chimney Starter filled with charcoal, you will need a source to light it. I always use Weber paraffin wax cubes. 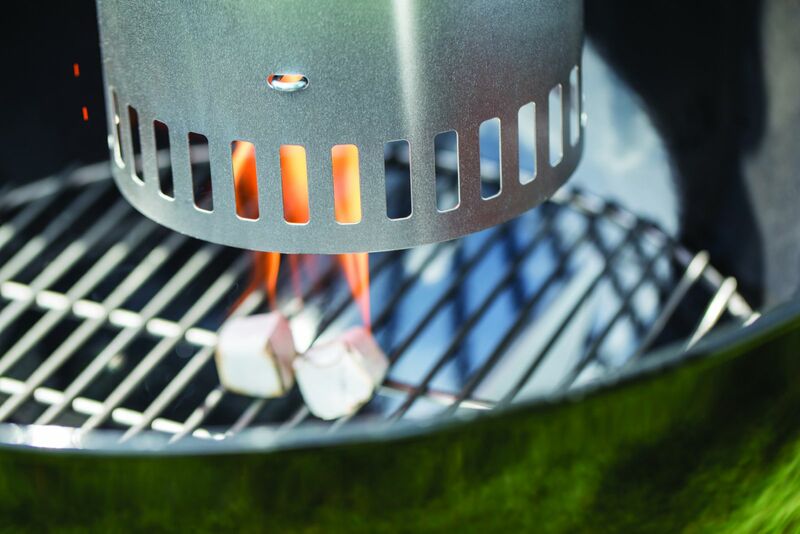 After you pour your charcoal into the chimney starter you will want to place it on your charcoal grate. Make sure to remove your grilling grate and hang it on the outside of the grill until your charcoal is completely ashed over, about 10-15 minutes, and you’re ready to start preheating your grill. From there you will place two of the wax cubes in the center of the charcoal grate and light them. Then place the charcoal filled chimney starter on top of the lit wax cubes. The wax cubes are great because they light when wet, stay lit in windy conditions, burn long enough to get your charcoal lit and they are non-toxic! Weber paraffin wax cubes have taken the hassle out of lighting charcoal. You can even use them for getting your bonfire going in the summertime. A little tip, if you happen to run out of wax cubes another option is taking a couple pieces of paper towel, soaking them with olive oil, placing them under the chimney starter, and lighting them with a match through the bottom holes on the chimney starter. So next time you are outside grilling on your Weber charcoal grill, I dare you to try out the Weber Chimney Starter and Paraffin Wax Cubes and I promise you will never say yes to lighter fluid ever again.